Abrasions, made by rubbing or scraping. Floor burns or scuff burns, although called burns, are actually wounds. Incised wounds, sharp cuts that tend to bleed freely. Lacerated wounds, jagged or irregular wounds, often associated with much tissue damage. Puncture wounds. A tack, run through the skin, makes a typical, small puncture wound. Caring for wounds in which bleeding is not severe is easily done. All adults working with children should know the basic steps. Wash your hands thoroughly with clean water and soap. Cleanse the injury thoroughly, using plain soap and boiled water cooled to room temperature or clean running tap water and soap. Apply the soap and water with a sterile dressing. Apply a dry sterile or clean dressing, and bandage it snugly into place. See a doctor promptly if evidence of infection appears. For wounds in which bleeding is server, the objective is to stop the bleeding at once. Always stop the bleeding with pressure directly over the wound with a cloth, if possible. Loss of over a quart of blood may be serious, especially in young children, the aged, and debilitated. Direct pressure. Use a clean cloth or a part of the clothing in real emergencies. Apply direct pressure directly over the wound. After the bleeding has been controlled, apply additional layers of cloth to form a sufficient covering, then bandage snugly or firmly. Pressure to the supplying vessel. Use the heel of your hand to press the supplying vessel against the underlying bone. Such pressure causes the bleeding to diminish, but doesn’t stop it entirely. 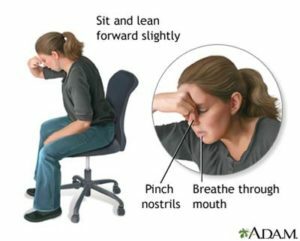 If an extremity is involved, elevate it, using pillows or substitutes. If there is a delay getting professional medical care, make sure to give the injured person plenty of water if they’re thirsty. You want to make sure they’re properly hydrated. Do not give alcoholic drinks, or give water if there is a penetrating wound of the abdomen or lower chest.